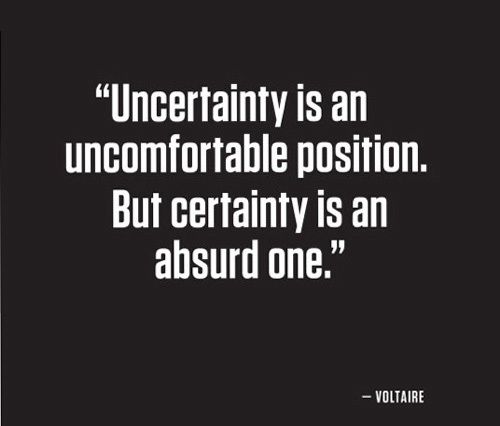 Uncertainty is an uncomfortable position, but certainty is an absurd one. Entrepreneurs are great at dealing with uncertainty and also very good at minimizing risk. That’s the classic great entrepreneur. Turns out Picasso’s passion for uncertainty, mystery, and the thrill of life never ended. Uncertainty’s not good for anybody. No one has any idea what’s next… the uncertainty of the business climate in America is frightening, frightening to everybody, and it’s delaying the recovery. When there’s uncertainty they always think there’s another shoe to fall. There is no other shoe to fall. I always work out of uncertainty but when a painting’s finished it becomes a fixed idea, apparently a final statement. 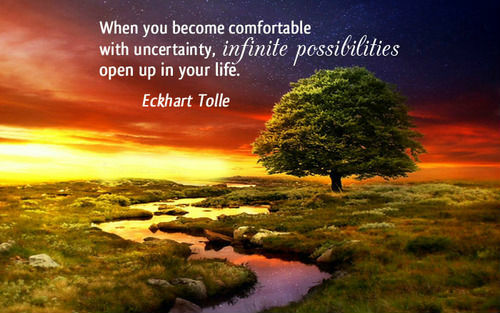 In time though, uncertainty returns… your thought process goes on. One of the things that has been very difficult in Libya is the sense of uncertainty – the sense that they haven’t actually finished the revolution, that there was still a great deal of uncertainty. That uncertainty has made Libya harder for business in terms of oil and other things as well.